This article is part of Index on Censorship partner Global Journalist’s Project Exile series, which has published 52 interviews with exiled journalists from 31 different countries. For many tourists, the Maldives is a resort destination with straw-thatched luxury bungalows perched atop the clear blue Indian Ocean. But for journalist Zaheena Rasheed, this small island nation, located off the southwest coast of India, is home. At least, it was. 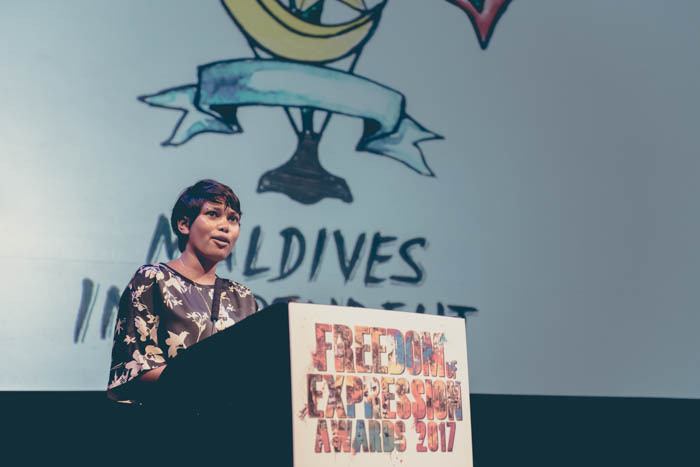 Index on Censorship Freedom of Expression Awards 2017 Journalism Fellow Rasheed, who was born in the Muslim-majority archipelago of 400,000 and attended college in the USA, developed an interest in journalism in 2008 when she took a semester off school to intern at the Maldives Independent news site. While there, she covered the country’s first multiparty elections, in which human rights activist and former political prisoner Mohamed Nasheed defeated longtime dictator Mamoon Abdul Gayoom. 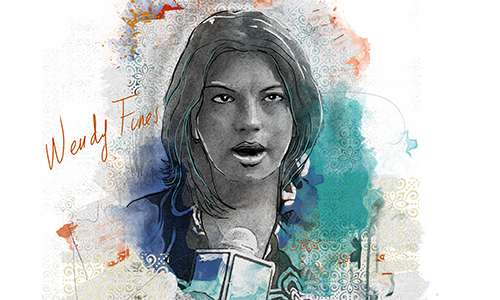 Rasheed went to work full-time at the Independent and began climbing the ranks, but her professional life took a turn in 2012 after the democratically-elected Nasheed was forced from power and the space for the independent press and government criticism began closing. In 2014 a colleague who was known for criticising Islamists and the government, Ahmed Rilwan, went missing. By 2015, she was editor-in-chief of the Independent, but the political situation in the Maldives had worsened. The former president Nasheed was jailed and eventually went into exile in the UK while travelling there for medical treatment. Press freedoms worsened in August 2016 when the new president Abdullah Yameen signed into a law a sweeping criminal defamation law that carried large fines and jail terms for slander as well as speech that threatens “social norms” or national security. Rasheed and 16 others journalists were detained for protesting the law. By then Rasheed had earned the government’s ire through the Independent’s investigation into Rilwan’s disappearance as well as corruption in Yameen’s government. A tipping point came when she appeared in an explosive Al Jazeera investigative documentary in September 2016 called “Stealing Paradise.” The program implicated the highest reaches of Yameem’s government in a $1.5 billion international money laundering scheme. Knowing she would face repercussions, Rasheed fled to Sri Lanka just days before the documentary was released. 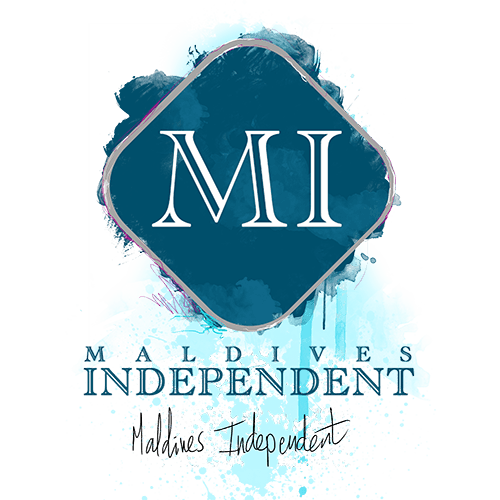 Hours after it appeared online, police raided the offices of the Maldives Independent. Rasheed continued to edit the Independent remotely, but in April 2017 she moved to Qatar and accepted a reporting job with Al Jazeera. Global Journalist: What have been some of the effects of the anti-defamation law in the Maldives? Rasheed: I left just three weeks after the defamation law came in, so I haven’t felt the effect of it myself, and it’s been about a year since I’ve left the Maldives…But it’s really had a chilling effect. People are a lot more careful about what they report on and what they say. One of the television stations has been fined a number of times, and they’ve essentially had to set up donation boxes to collect the money to pay off these fines. And the law allows for the government to shut them down if they’re unable to pay the fines. Tell me about the disappearance of your colleague, Ahmed Rilwan. He was about 28, I think, when he disappeared. He was just a really wonderful human being, and he cared a lot about doing stories about rural Maldives, which is not covered very well by the local media. He also was quite a prominent blogger. He was quite prolific on social media before he joined our team. He was known for satirizing the religious extremists, and he received quite a lot of threats over the years…as did many other journalists. For me, it was obviously one of the most important events of my life in some ways. Just to have someone you work with, you know, just to have them disappear like that. It was the first disappearance of that kind, and I think it made us all realize that it could happen again, and it did. In April one of Rilwan’s best friends [a political blogger] was killed as he came home from work. What has it been like living in exile and working for Al Jazeera in Doha? Al Jazeera has been really, really great. I think a lot of people who go into exile, it’s just this sense of having your moorings cut and not knowing what to do next. You know, to have this life and then just to be uprooted from it, to be away from your family and your daily routine and your job and everything that gave you meaning. It’s very jarring in many ways…it really impacts your sense of both identity and also…what gives you purpose and meaning in life. Suddenly all of that is taken away. Do you think you will return to the Maldives one day? I do hope to return to the Maldives one day. I think the hardest part about living in exile has been missing deaths and births. My grandmother died last December, and then I just add[ed] a baby niece, so I’d like to go back and see her. When you return to the Maldives, do you think you will continue being a journalist? Not for a little while I guess, and it depends on what happens in the Maldives. It will be really hard to go back and do exactly the same thing I was doing without persecution. I think if I were to go back and continue doing the same job, it’s just a matter of time before I’m picked up again. zaheena was always one of the least biased reporters the Maldives saw. least, biased. biased nonetheless.